Will Ferris scored 22 points to lead the way for the Cougars. (Photo by Duane Barker). 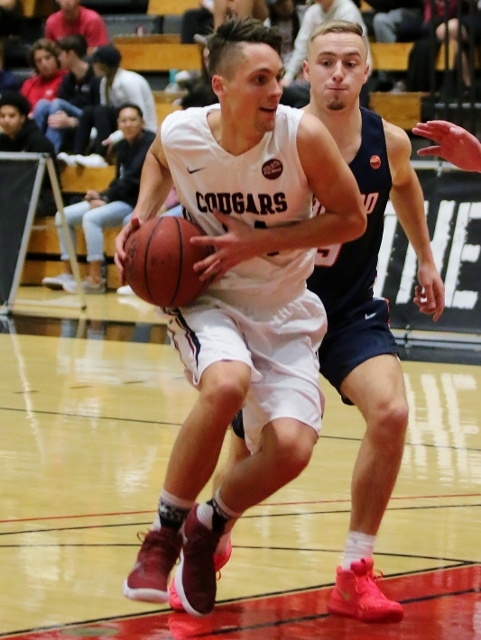 (Glendora) – Azusa Pacific outscored Fresno Pacific 21-4 over the last 7:39 of the first half to take a 46-25 lead into halftime and eventually rolled to a 96-63 rout Thursday night at Felix Event Center. The Cougars continued to roll in the second half and pushed the lead over 30 on a Noah Bundrant layup with 8:33 left to make it 74-43. Will Ferris led the Cougars in scoring with 22 points, (13 in the first half). Ferris was 6 for 11 from three point land and 8 of 14 from the field overall. Selom Mawugbe had 14 points while working down in the paint and pulled down 9 rebounds. Jake Spurgeon hit a pair of three pointers and finished with 10 and 6 boards. APU point guard Darien McClain, who dropped 22 on Biola last Saturday, finished with 9 points and dished out 4 assists. He sat out most of the second half. The Cougars also had a big edge in rebounding as they cleaned the glass for 36 boards compared to 28 for the Sunbirds. Selom Mawugbe had 14 points and pulled down 9 rebounds. (Photo by Duane Barker). Fresno Pacific only stayed with APU for about the first ten minutes of the game and could never dig itself out of the hole. Adrian Antunez led the Sunbirds with 16 points and Elijah Hill and Nate Kendricks each had 10. Fresno State shot just 29 percent from three point land compared to 46 percent for the Cougars. Azusa Pacific improved to 12-8 overall and 9-4 in the PacWest Conference with the victory while Fresno State dropped to 8-9 and 5-7. 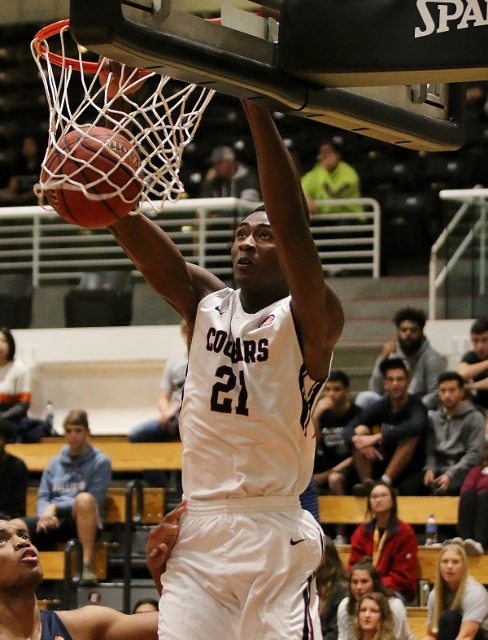 The Cougars will now travel to Hawaii to face Chaminade, Hawaii Pacific and Hawaii Hilo and won’t return home until Saturday February 16th to face Hawaii Pacific at Felix Event Center.